Rabbit Islanders Support One Another! Manitoulin Trading Post sells Helen Roy CD's! Rita (Jacko) Osawabine is a successful business owner. We have had a chance to visit with her on several occasions. We recently spent a few extra minutes talking with her about her life. Our apologies to Nixon, Helen's brother, who was waiting in the car. Like Helen, Rita was born and raised on Rabbit Island, on the Wikwemikong Unceded Reserve on Manitoulin Island. Rita and her late husband Frank have built a very good thriving business. In just a few minutes of talking to her, you realize that hard work is nothing strange to her, as well as it was a way of life to Frank. Together they shared a love of getting things done and the pride of accomplishment. Through the years they have employed many people. Their children each have their own busy lives now, thanks to the good example the couple set for them. You can tell that she is very proud of them. 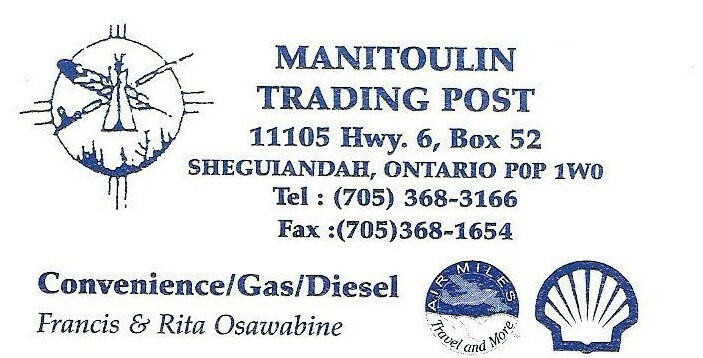 Their daughter Debbie now runs the Manitoulin Trading Post, the store that they founded. It is an efficient center of service to the community and a glowing example of what can be accomplished through hard work and attention to detail. She continues the legacy. We recommend that you stop in during your next visit to Manitoulin Island and we know that you will be happy that you did!